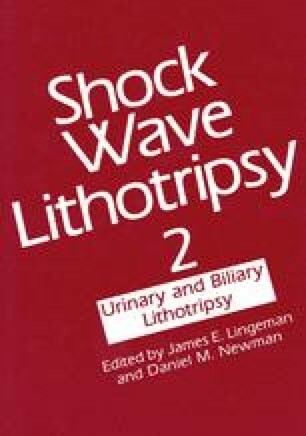 Shock waves generated during extracorporeal shock wave lithotripsy (ESWL†) therapy have produced both renal and extrarenal tissue injury.1–4 Renal injury, although not yet fully characterized, includes disruption of the vasculature, damage to the tubular epithelium, and apparent alterations in the renal interstitium. Whole animal studies are being used to document the types of tissue injury that occur during ESWL and are suitable for the investigation of how acute injury may lead to chronic alterations in kidney structure and function. However, in vivo studies may neither allow the adequate probing of the cellular basis of ESWL injury nor aid the understanding of the mechanism by which cells of the kidney are damaged. Such studies cannot precisely determine what role the various physical parameters of shock wave delivery play in producing cell injury. Therefore, investigators have employed cultured cells as model systems to investigate how shock waves injure cells and to determine the role of physical parameters in producing cell/tissue injury. A rationale for employing cultured cells as model systems in ESWL research is presented here, along with a discussion, from a tissue culture perspective, of the advantages and limitations of using isolated cells to better understand how shock waves injure cells of the intact kidney.